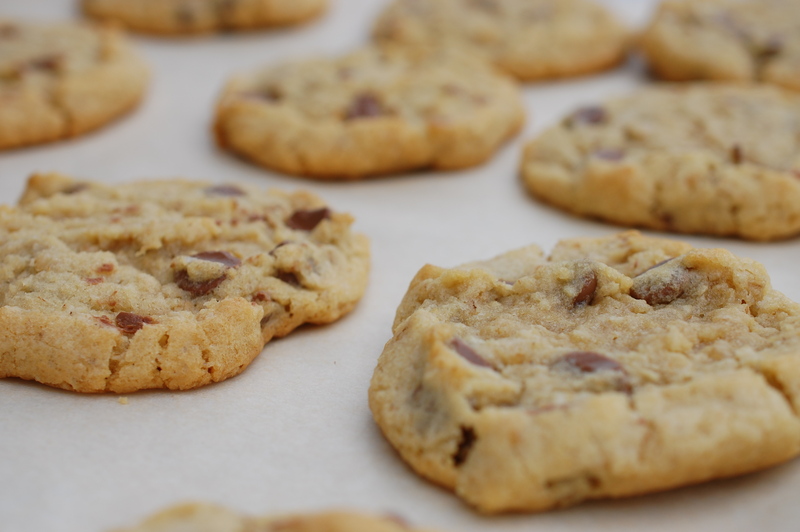 Speaking of chocolate chips … I’m excited to share our family’s new favourite oatmeal chocolate chip cookie recipe. My family has quite literally fallen in love with these. Last year, while visiting my husbands parents in Florida, one of their good friends Marian, baked up a batch of cookies to welcome our kids to the sunny south. Well, while the kids were busy swimming at the pool, this kid, was quite happily sitting in a lounge chair, devouring their cookies. They ended up being so delicious that I couldn’t help but mention to my mother-in-law before I left, how I’d just love to have the recipe. And sure enough, when she returned in the Spring, she presented me with a hand-written card from Marian for her oatmeal chocolate chip cookies and I’ve been baking them almost every other week, since then. 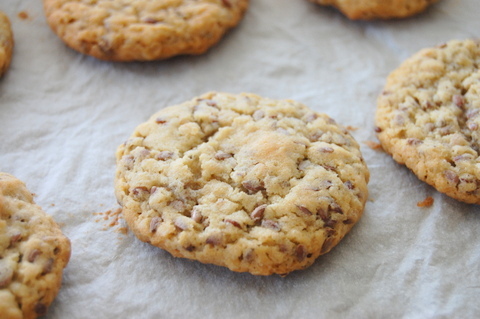 They’re a combination of oatmeal and milk chocolate chips that are crusty on the outside but are surprisingly thick and chewy on the inside. Besides being delicious, satisfying and easy to make, the dough is frozen and then sliced and baked. This is the perfect way to have something sweet on hand that can be baked up in just 10-12 minutes. Roll the dough in waxed paper, store it in the freezer and they’re readily on hand for those days when you need something in a hurry. 1. In a medium bowl, mix together the rolled oats and flour and set aside. 2.In a large bowl, cream the shortening and sugars together until pale and creamy (approximately 5 minutes). 3. Add eggs, one at a time, creaming well after each addition, followed by the vanilla and baking soda in hot water. 4. Add the dry ingredients and mix until just combined. Fold in the chocolate chips and nuts. 5. Divide dough into 2 halves. Roll each half in waxed paper and store in the freezer for a minimum of 1 hour. 6. When you’re ready to bake the cookies, pre-heat the oven to 350 degrees F and remove the rolls of frozen dough from the freezer. Slice the dough into 1/4 inch discs and place on a parchment lined cookie sheet. Bake for 10-12 minutes or until the edges are just slightly brown. If the dough has been frozen for a while, it may be necessary to wait 5-10 minutes before slicing. 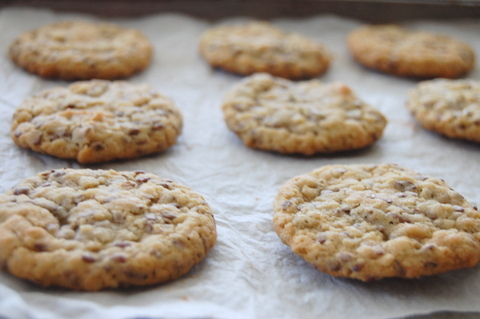 These cookies are best when not over-baked. I take them out when they still look slightly under-baked to ensure a chewy centre. 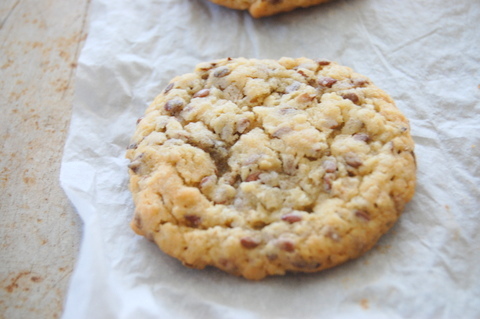 I found with this recipe, that it’s important to line your cookie sheet with parchment paper. This is a step that I always used to skip, but now understand how it helps to keep baked goods from over-browning on the bottom, while waiting for them to get perfectly baked in the centre. Parchment paper can usually be found in your local grocery store next to the waxed paper and plastic wrap. 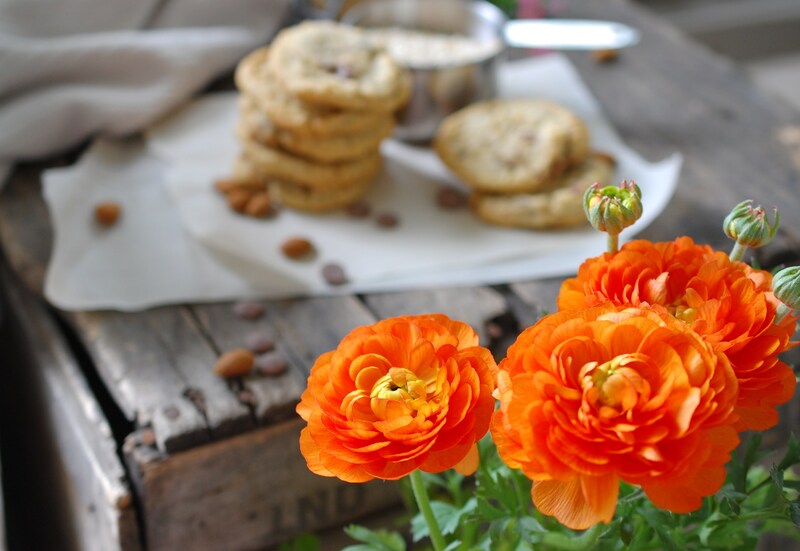 I typically like to use butter in my cookie recipes but decided to follow the recipe and use shortening – the results speak for themselves – everyone loves them. I haven’t tried a butter substitution yet, but I’m curious to know how they would turn out. 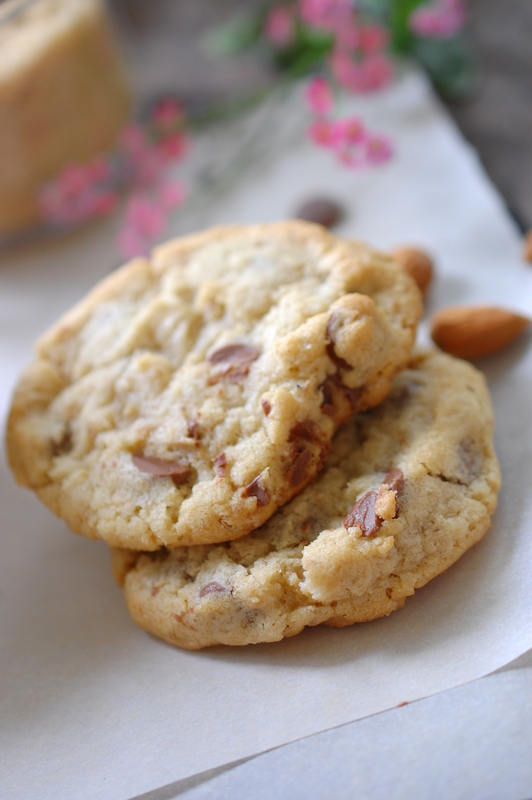 I use Callebaut milk chocolate chips for this recipe but any chocolate chip will work. I usually double the recipe, so I have extra rolls on hand.